낙안성의 동문과 서문을 잇는 큰 도로의 서쪽, 큰 길로부터 북쪽으로 들어가는 골목길에 위치한 초가집이다. 부엌 1칸, 방이 2칸인 아주 작은 집이다. 담장을 쌓다가 터 놓은 부분이 대문인데, 대문을 들어서면 제법 넓은 마당이 있고 마당 깊숙한 곳에 안채가 남향하여 자리잡고 있다. 부엌·큰방·작은방의 순으로 배열되어 있으며, 방 앞에는 툇마루가 있고 큰방 뒷쪽으로 작은 벽장이 있다. 작은방의 옆쪽으로는 'ㄱ'자로 꺾인 돌담을 쌓아 그 사이의 공간을 헛간으로 이용하고 있다. 부엌의 앞에는 우물이 설치되어 있고 넓은 마당의 한 곳을 채마밭과 텃밭으로 쓰고 있다. 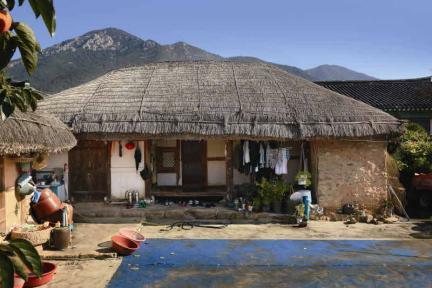 This thatched house is located at the alley, which is the entrance to the north from the west side road, connecting the east gate and west gate of Naganseong Fortress. The small house consists of a kitchen and two rooms. The open space between the walls is the gate of the house. As soon as one walks through the gate, one sees a relatively wide courtyard. 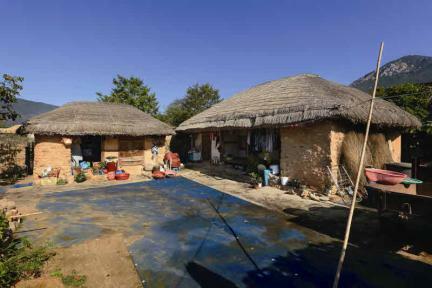 Inside the yard is the anchae (women's quarters) facing south, which consists of a kitchen, a big room, and a small room. Each room has toenmaru (wood-floored veranda). A small wall closet was installed at the backside of the big room. At the side of the small room, a stone wall was built in the “ㄱ” shape. The space between them is used as a shed. A well was installed in front of the kitchen. One part of the yard is used for growing vegetables. ※ Viewing of the cultural property above is usually available anytime but may be limited depending on the owner’s personal circumstances.